Fort Lauderdale has long been touted as the "yachting capital" of the world. This weekend, the city is hosting the "International Boat Show". This year, the mega-yachts, yachts, boats and boating equipment on display are valued at over 2 billion dollars. When I first moved to Fort Lauderdale, the boat show was dazzling. What was on display 10 years ago pales into insignificance now. Today, Spouseman, Light of My Life and I were headed on our boat just to ride by the main staging area on the water. I got a call from one of my Mexican brothers. He was sobbing. Last night he was on the phone with his father back in the village he comes from. They talked about the fact that F. will be home around the 20th of December. They laughed a lot. His father ended the conversation telling his son how much he loved him. Sometime later in the night, the father's body, worn out by dialysis and diabetes, finally gave out. His wife realized he was dead early, early this morning. F. got the call as dawn broke. My brother and friend barely managed to choke out these words: "As I was preparing to come to the United States last April, I had promised my father that I would send him money to buy a new mattress for their bed. The one they had was in such bad shape. But all I have managed to do is send money for my wife and daughter to eat, to pay the bills. I never could send mi papa the money to buy a new mattress." Playing on a CD: "I do Believe"--a sweet, simple tune from this year's VBS. Light of My Life: What are you going to do today, Mami? Me: Oh, man, do I ever have a lot of work to catch up on. It's hard being gone from the church for so many days. Light of My Life: Are you going to have a service? Me: No, not today. Lots of meetings, lots of catching up to find out how everything has been while I was gone. Light of My Life: Is Miss B. going to be there? Me: Yes, she's one of the people I'm going to talk to today. Light of My Life: Mami, everybody is going to be so happy today at your work. Light of My Life: Oh yes, Mami, everyone was missing you so much when you were gone. Now they can all be happy. What is it about that little exchange that makes me feel like the luckiest person in the world? I came to this conference kicking and screaming. I didn’t even get all the pre-conference assignments completed. Last week, I grudgingly accepted the possibility that not getting that work done even after having made the commitment to come was an indication that just maybe, this might not be bad thing to do. It got started like so many of these conference do—the opening reception, the meal, the first plenary. There was the standard ice-breaker, the awkwardness I always feel when I get to one of these events and I have to make myself meet people, and still the somewhat resentful sense of “been here, done, this, I want to go home.” At 8:30 we finished the first plenary and were invited to cross the parking lot to the chapel to end our first day together with Compline. 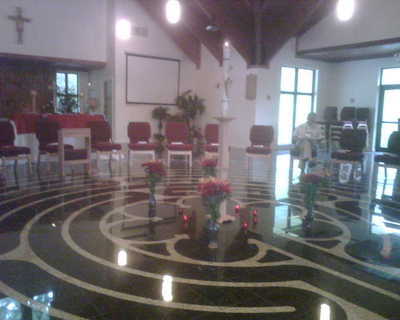 Schofield Chapel is lovely sacred space. The floor has a labyrinth pattern and there is a simplicity of lines that I always appreciate when I come to the Duncan Center. I’d never been to a service here after dark. 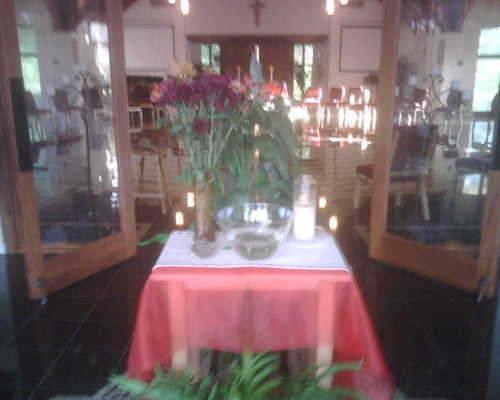 There was a small simple table in the Narthex with a clear glass bowl of water, a shell next to it, flowers, several lit candles. Beyond, in the Nave, the Paschal Candle had been placed in the center of the labyrinth, and had been lighted. Small votive candles and flowers had been gathered around it. All through the chapel there were more candles lit, the lights had been dimmed and the seats were also gathered in a circle around the Paschal Candle. I don’t usually do this, but I dipped my fingers in the cool water, crossed myself and entered with tears stinging unexpectedly. Each Saturday, I am usually the first person to get to the Centro. I am always the person who sets out the chalice and paten, the linens, the cruets with wine and water. Experience, hope, and at least some small measure of wishful thinking guide me as I take out wafers as well. You never know when new people might come through that red door. I cue the CD I’ve prepared, anxious always that the music will actually be singable and relevant. And I put the missals I have prepared earlier in the week out on the table next to the door. Each of those steps is an act of love and faith, though I don’t really know that most of the time. Likewise, I find myself spending a great deal of time talking, listening, praying, looking and trying to learn as much as I can about new forms of celebrating the Eucharist in the Episcopal Church as we prepare to start a third service on Sunday morning at All Saints. This work is a little less lonely than my work at the Centro. I feel like I am making that journey with a sister in the Spirit. She does this work with equal or greater seriousness and dedication and I think I speak for both of us that we are doing it with fear and trembling. So last night, when others had worked so hard to open an environment where I could explore and deepen my relationship with God through worship, when all I had to do was come in, I was overwhelmed by the gift I had just been given. And I realized that this whole week is a gift for me to enjoy. With this posting, I am checking out of the Internet and everything else except my husband and daughter until next Monday evening. Please pray for me and my new friends, all of us priests, who are not the most willing of receivers, yet who so often run on empty. I bet I’ll have lots to talk about when I get back! I am participating in something called "CREDO" starting on Monday. It is an 8-day opportunity offered by the Episcopal Church to its clergy that allows them to stop and take stock of life as a priest. During this time, a group of some 20 Latino clergy will assess where we are in terms of our financial, spiritual, vocational, and physical well being with the help of a pretty competent team of experts. I will be removed from my day-to-day responsibilities, staying at retreat center up in Boca Raton. I go into this experience dealing with a healthy dose of shame and anxiety. I did not pay enough attention to the prep materials and I have missed the window to do some of the key pre-conference assignments. Earlier in my life, I would have allowed myself to find a way to wiggle out of this commitment rather than take responsibility for not having done that which I ought to have done. This time, while I am not comfortable with the sense of failure before even getting started I am willing to say that this is perhaps the very reason why it is important that I go. I have now been working on some of the assisngments and have realized that I would probably have gotten even more out of this opportunity 2 or 3 years ago. I was coming to the end of the line with the ways I had of getting through the day. I was reactive, scared, exhausted, struggling to avoid giving into despair. That showed in every single part of my life. But these past two years, by God's grace, so much of that has changed. I can honestly say that I could not imagine having a better ministry than I do today. If you follow my blog you know that this year has been simply miraculous when it comes to my health--physical, spiritual and emotional. I may have talked about this in a previous blog but I don't remember and I'm not going back to look: Even further back in history, I heard the sermon that has perhaps most changed my life, a sermon given by another priest at All Saints. In his sermon, John talked about an overnight retreat he took in Israel, a retreat where he felt like he was breathing in the desert, so that heat and dry so permeated his being that it seemed like he would die. He talked about how life gets like that sometimes and we are left with the choice of death or a new willingness to dig further into the depths of our existence in search of the living waters. When I look at that point I had reach a couple of years ago, that was the choice I faced. It was not my own strength that allowed me to keep looking for the living waters. I know that for sure. But that strength did allow me to keep looking until I found them. So when I look at where I am, I feel real joy and gratitude because in so many ways, my life is exquisitely, almost painfully lovely and full. I'll have to come out of this workshop with a "plan for improvement" and I am sure that there will be some very important things I will discover I need to work on. But tonight, shame and all, I get to say, my life is pretty darned good. If you keep up with this blog, you know that a big part of my life right now is the small storefront ministry to Latinos in my community that I am a part of. Here's how tonight went. Just as I was arriving at the Centro, a jeep pulled in behind my car and two rather stout and formidable looking women got out. They were headed to get takeout from Shanghai, the Chinese restaurant right next door to us. I finished opening up and our small ragtag bunch began to gather. Soon, the takeout ladies were standing looking at our window with some curiosity. Along with our logo, we have a small rainbow flag on a corner of the window. D, the chief evangelist among us, a lovely young laywoman, had decided months ago that we needed to make it clear to our Latino brothers and sisters in the neighborhood that everyone is welcome at the table. Americans both of them, and partnered to each other, the two women had never come across a church that welcomed gay and lesbian people. They don't speak Spanish but were thrilled to find out that they are welcome at the "mother ship"--the parish the Centro ministry is a part of. We sent them off with their takeout and an invitation to participate in the main service on Sunday at All Saints. Soon, A and M arrived with a Mexican feast: tongue tacos, chili sauce that would burn the taste buds off your tongue and other good eats. Many of our guys are Mexican and have been desperate for home-tasting food. Some had come ahead of time and set a really formal table in preparation for the feast. Quick prayers and the eating began. And more guys arrived, and then some more. Two of them are our well-loved drunks--men with truly serious drinking problems who come as often as the bottle allows them. One of them had another pal with him. A table meant to accommodate 10 was found to be big enough to seat 15 of us, and the tacos multiplied. After dinner, we began our study of the sixth chapter of the book of Acts: the call and ordination of Stephen and the others, the emergence of the order of deacons. I asked, "do any of you know any deacons." After some thought, one of the guys said, "Ah, si...there's one that comes to see me in jail." Another one said, "Oh--those men that come see us in the slammer are deacons? Sure, I know one. Real nice guy." And another member of the study group acknowledged that he too had received more than one visit from a deacon while in jail. Somehow, that gave the first man who'd spoken permission to tell us that he's only out of jail temporarily. He told us how much he appreciated sitting at table and breaking bread with us in this in-between time. He asked us to pray for him because he's going back to jail real soon and may not be back to the Centro for a while. But he promised if he got out, he'd be back. Then we went back to our conversation about deacons and then read about Stephen. We'll discuss his martyrdom next week. When we finished, I got into my car feeling like I was having an out of body experience. The Word has never been more alive, or vivid, in all the absurdity, impossibility and joy of hope, than with this gathering of broken, marginalized folks. This is It. Ecclesia. Kairos. The Whole Enchilada. And by God's grace, I have been invited to the table. Proclama mi alma la grandeza del Señor.